So why do Mind Maps work? Can’t I just stick to my lists and my conventional tried and tested techniques? 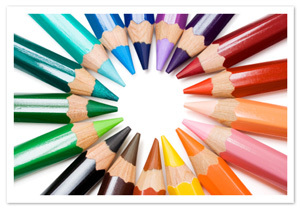 The Mind Mapping process involves a unique combination of imagery, colour and visual-spatial arrangement which is proven to significantly improve recall when compared to conventional methods of note-taking and learning by rote. iMindMap is faithful to these methods with colourful branches and a range of customisable layout Styles to enhance stimulation. A study by Farrand, Hussain and Hennessey (2002)ii found that Mind Mapping improved the long-term memory of factual information in medical students by 10%. They reported that “Mind Maps provide an effective study technique when applied to written material” and are likely to “encourage a deeper level of processing” for better memory formation. Research by Toi (2009)iii shows that Mind Mapping can help children recall words more effectively than using lists, with improvements in memory of up to 32%. Glass and Holyoak (1986)iv found that by gathering and highlighting key branches within a boundary, such as a highlight cloud, you’re using a memory technique known as chunking. Our short-term memory is on average only capable of storing seven items of information and chunking can help us use this storage space more effectively. Mind Maps really come into their own for encouraging creativity and enabling you to generate new ideas in brainstorming sessions. The software includes large image and icon libraries to catalyse creativity and the cutting edge SmartLayout to keep Mind Maps tidy and structured when getting ideas down fast. The spatial layout helps you gain a better overview and makes new connections more visible so you can create an infinite number of thoughts, ideas, links and associations on any topic. A study by Al-Jarf (2009)v proves that Mind Mapping software offers a powerful approach for improving the ability of students to generate, visualise and organise ideas. The students involved reported that the Mind Mapping tool encouraged creative thinking and they became faster at generating and organising ideas for their writing. According to Margulies (1991)vi , before children learn a language, they visualise pictures in their minds which are linked to concepts. Unfortunately, once children are trained to write only words in one colour, on lined paper, their creative channels and mental flexibility diminishes. Using images, like Mind Maps, keeps this creativity fired up. Goodnough and Woods (2002)vii discovered that students perceived Mind Mapping as a fun, interesting and motivating approach to learning. Several students attributed the fun aspect to the opportunity to be creative when creating Mind Maps through lots of choice in colour, symbols, key words and design. Mind Mapping has been shown to bring a renewed sense of enthusiasm to the classroom because it increases student confidence and sense of skill in mastering assigned materials (Mento et al, 1999)viii . 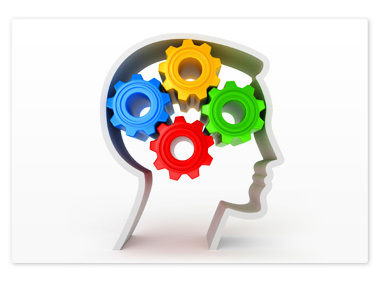 See our 7 Mind Mapping Uses for Students for some inspiration on how to get started. 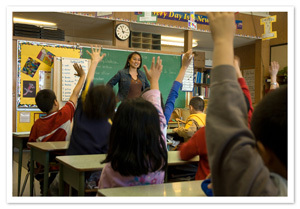 Its flexibility also means that it possesses several uses in the classroom. Using Mind Mapping software in the classroom is a successful way to support children’s exploration and presentation of ideas. Ralston and Cook (2007)ix found that an exercise involving Mind Mapping software provided a useful focus for pupils to organise their thoughts and to present information clearly and attractively. It also facilitated communication between pupils. A study by Holland et al (2003/2004)x found Mind Mapping to be a useful technique for helping students plan and structure their essays and projects more effectively. Students were able to improve the structure, coherence and, consequently, the quality of their written work and were able to draw value from the technique for project managing practical work. Mento et al (1999) found that executive students using only their Mind Map for presentations were able to handle challenging questions with confidence. They had better recall of the information because it had been captured and stored in an integrated, radiating manner rather than linearly. Students could internalise it better because it was their unique representation of the information. A study by The Wharton School (1981)xi proved the benefits of utilising visual elements in presentations and tightly integrating them with words. Presenters who used visual language were perceived by the audience as more effective – they were clearer, more concise, more interesting, more professional, more credible and better prepared. 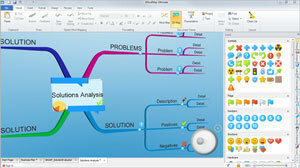 iMindMap continues the success of Mind Map based presentations with Presentation View, a double-screen feature which gives the presenter complete control over their presentations. 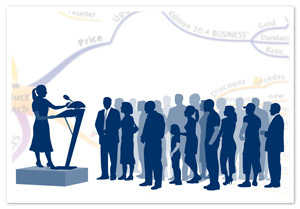 Plus, taking presentations to the next level in impact and interactivity, is our totally unique 3D View. A Mind Map is an excellent tool for collaborating with others to develop plans or implement key projects. 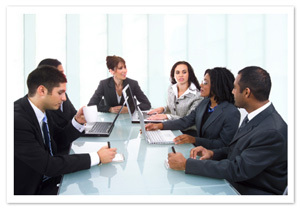 It allows you to harness the input of all members of a group in a dynamic and creative way. All ideas or statements can be recorded in an appropriate place on the Mind Map and discussed openly at a sensible time. MindMap includes many collaborative tools, including a screen capture function, designed to let users communicate their ideas quickly to others. Zampetakis et al (2007)xii found that students preferred to work with Mind Maps in teams. This allowed them to develop synergistic interaction, assemble collective knowledge and work with a group minded attitude. The flow of communications between group members also contributed to the creative process. Mueller et al (2002)xiii describe how the use of Mind Maps to plan patient care at Front Range Community College has resulted in enhanced thinking skills including critical thinking, whole-brain thinking and comprehensive thinking. The strategy promoted holistic care planning through focusing on the patient as the centre of the care plan and by enabling interconnections to be made between related nursing diagnoses and patient care data. Mind Mapping brings together your left brain (words, logic, numbers, linearity) and right brain skills (curves, colour, rhythm, images, space) making your brain’s performance more synergetic. This means that each cortical skill enhances the performance of other areas so that the brain is working at its optimum. 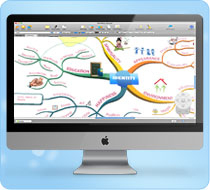 iMindMap, the only Mind Mapping software endorsed by Tony Buzan, combines all the proven elements of Mind Mapping with cutting edge technology to produce a tool that really does work. Harnessing the techniques that have been scientifically researched and documented has culminated in a software tool that is truly effective in increasing our thinking abilities, enhancing creativity and improving memory. iMindMap can enhance and advance a whole array of activities, including organising, creating, innovating, planning, presenting, note taking, learning, structuring, communicating, problem solving and project managing. To learn more, you can download the full report on Mind Mapping with Scientific Research and Studies. i Anokhin P.K. (1973), The forming of natural and artificial intelligence. Impact of Science in Society, Vol. XXIII 3.
ii Farrand, P., Hussain, F. and Hennessy E. (2002), The efficacy of the ‘mind map’ study technique. Medical Education, Vol. 36 (5), pp 426-431.
iii Toi, H (2009), Research on how Mind Map improves Memory. Paper presented at the International Conference on Thinking, Kuala Lumpur, 22nd to 26th June 2009.
iv Glass, A.L. and Holyoak, K.J. (1986), Cognition. New York: Random House. v Al-Jarf, R. (2009),Enhancing Freshman students’ Writing Skills with a Mind Mapping software. Paper presented at the 5th International Scientific Conference, eLearning and Software for Education, Bucharest, April 2009.
vi Margulies, S. (1991), Mapping Inner Space: Learning and Teaching Mind Mapping. Zephyr, Tucson, AZ. vii Goodnough, K. and Woods, R. (2002), Student and Teacher Perceptions of Mind Mapping: A Middle School Case Study Paper presented at the Annual Meeting of American Educational Research Association, New Orleans, 1st to 5th April 2002.
viii Mento, A. J., Martinelli, P. and Jones R. M. (1999), Mind Mapping in Executive Education: Applications and Outcomes. The Journal of Management Development, Vol. 18, Issue 4.
ix Ralston, J. and Cook, D. (2007), Collaboration, ICT and Mind Mapping. Reflecting Education, Vol. 3, No. 1, pp 61-73.
x Holland, B., Holland, L. and Davies, J. (2003/2004), An investigation into the concept of Mind Mapping and the use of Mind Mapping software to support and improve student academic performance. Learning and Teaching Projects 2003/2004, pp 89-94.
xi The Wharton School (1981), A Study of the Effects of the Use of Overhead Transparencies on Business Meetings.Wharton Applied Research Center, The Wharton School, University of Pennsylvania. xii Zampetakis, L. A., Tsironis, L. and Moustakis, V. (2007), Creativity Development in Engineering Education: The Case of Mind Mapping. Journal of Management Development, Vol. 26, No. 4, pp 370-380.
xiii Mueller, A., Johnston, M. and Bligh, D. (2002), Joining Mind Mapping and Care Planning to Enhance Student Critical Thinking and Achieve Holistic Nursing Care. Nursing Diagnosis, 13, 1, pg. 24.